Born April 1757 in Stratford, CT, Abner Barlow moved to NH in 1772. 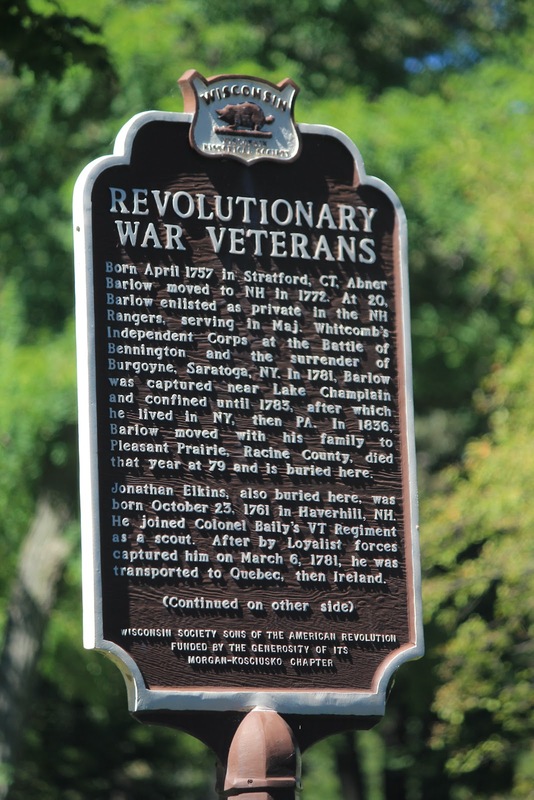 At 20, Barlow enlisted as private in the NH Rangers, serving in Maj. Whitcomb’s Independent Corps at the Battle of Bennington and the surrender of Burgoyne, Saratoga, NY. In 1781, Barlow was captured near Lake Champlain and confined until 1783, after which he lived in NY, then PA. 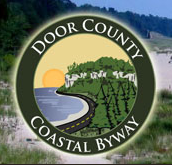 In 1836, Barlow moved with his family to Pleasant Prairie, Racine County, died that year at 79 and is buried here. Jonathan Elkins, also buried here, was born October 23, 1761 in Haverhill, NH. 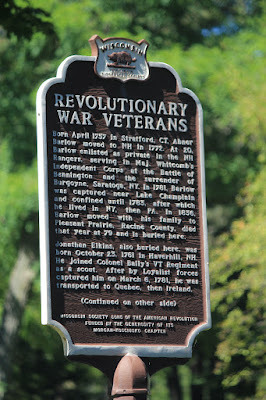 He joined Colonel Baily’s VT Regiment as a scout. After [by - sic] Loyalist forces captured him on March 6, 1781, he was transported to Quebec, then Ireland. Later moved to Mill Prison, Plymouth, England, he was exchanged for one of Cornwallis’ men and returned to Peacham, VT in 1782. After the war, Elkins moved to Albion, NY c.1836. In 1843, he moved to Kenosha and died on May 16, 1852 at 91. John Coleman, born 1761 in NYC, enlisted at age 15 in a company of Rangers under Capt. Fundy and Col. Livingston. In 1777, he re-enlisted for nine months in Col. Graham’s Regiment. After seeing action in Burgoyne’s Campaign, he enlisted again in the Rangers under Col. Warner. Later, while serving in Captain Heanman’s company of Rangers, he scouted against the Tories. 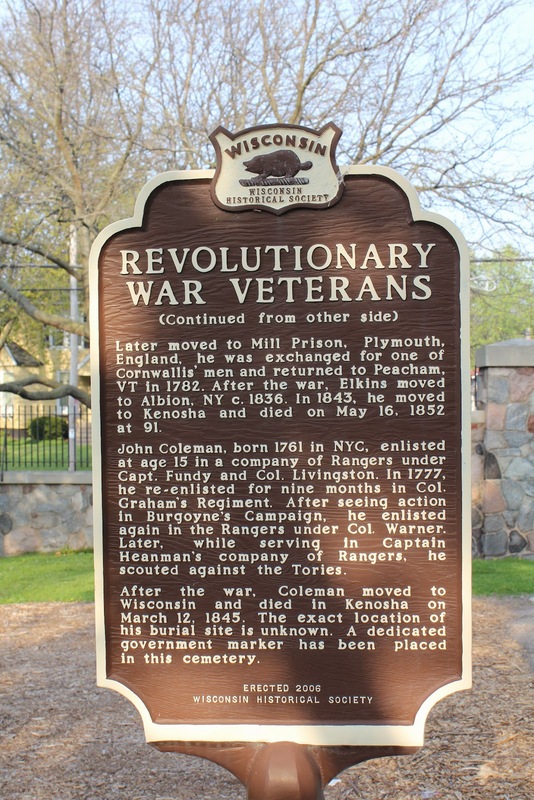 After the war, Coleman moved to Wisconsin and died in Kenosha on March 12, 1845. The exact location of his burial site is unknown. A dedicated government makrer has been placed in this cemetery. 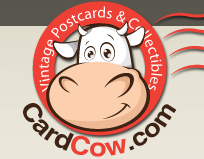 The marker is located at Green Ridge Cemetery, 6604 7th Avenue, Kenosha, Wisconsin 53143. NOTE: The marker is located on the east side of the cemetery, at the 7th Avenue entrance to the cemetery; it is impossible to miss. burial sites of "Notable Kenoshans". The marker is at the 7th Avenue entrance to Green Ridge Cemetery. The gravesite of Abner Barlow. 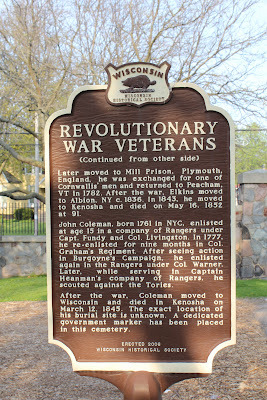 The marker is located at Green Ridge Cemetery in Kenosha, Wisconsin.